Send 400 gm Mixed Dry Fruits in a Fancy Box to all cities in India at Midnight. 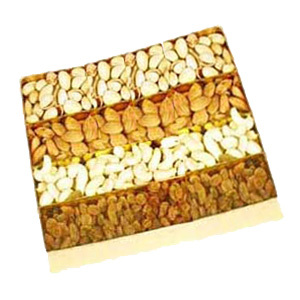 Send this dry fruits box consisting of 100 gmpista, 100 gm almonds, 100 gm kaju and 100 gm raisins recpectively. You can team this dry-fruits along with other Gifts across India through GiftsAcrossIndia.com and make the moments special forever. Please note: The arrangement is indicative, it may vary from city to city.